Well, this is one of those interesting items that, while I took pictures of it, I didn't even write a SINGLE NOTE about anything. Good gosh .. here it is one year later and I'm expected to REMEMBER details? Heck, I can't even remember what I had for breakfast these days! However, I know the wonderfully bizarre design came from Urban Threads. As for the pillow form ... 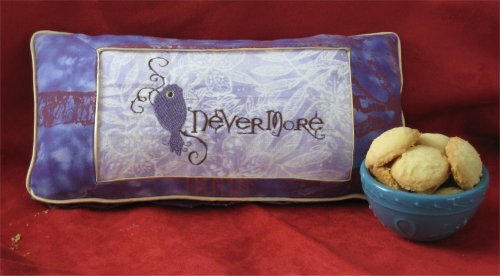 I had purchased the small, narrow pillow insert at "sometime" in the past, with a definite project in mind, I'm sure. But who knows *now* what that intent was? It was put to a better use for this project. Using purple scraps I had leftover from various projects for the pillow, I also put a gold fabric flange around the embroidered insert and a piping in gold fabric in the seam. The piping is not only decorative but helps makes the seam last longer because it takes all the wear and abuse instead of the seam itself.